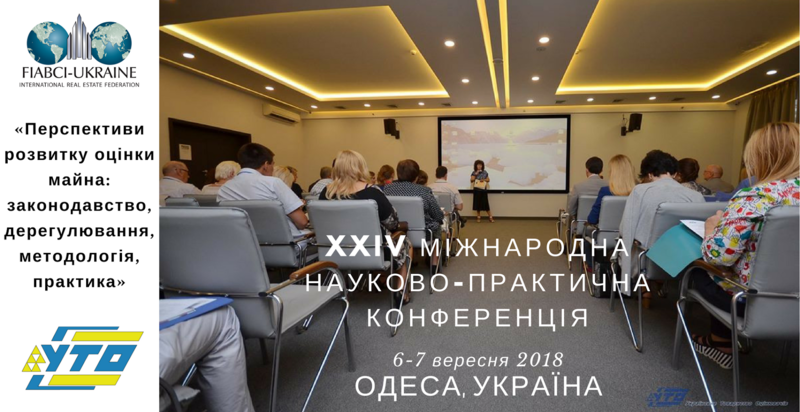 XXIV International Scientific and Practical Conference: "Prospects for the Development of Property Valuation: Legislation, Deregulation, Methodology, Practice" will be held in Odessa on September 6-7, 2018.
with the participation of representatives of the State Property Fund of Ukraine, the National Commission for Securities and Stock Market, the National Bank of Ukraine, the Guarantee Fund for Individuals Deposits, the State Geocadaster, the Antimonopoly Committee of Ukraine, the Business Ombudsman of Ukraine, the State Regulatory Service of Ukraine, international partners - TEGoVA, FIABCI, The evaluators of the self-regulatory organizations of Azerbaijan, Armenia, Belarus, Georgia, Kazakhstan, Kyrgyzstan, Latvia, Lithuania, Moldova, Poland, Romania invite you to take part in the XXIV International Science Pact The conference "Prospects for the Development of Property Valuation: Legislation, Deregulation, Methodology, Practice", which will be held September 6-7, 2018 in Odessa, at the address: Gagarin Plateau, 5. The purpose of the conference is to: discuss short stories in European and domestic normative and legal, methodological basis of appraisal of property and property rights as well as their influence on the development of valuation activities. 1. Fundamentals of state and public regulation of valuation activities. The powers of the SPFU and other state regulators (FGVFO, NBU, NCBMS) of valuation activity, interaction with self-regulated valuers' organizations, common legislative requirements and standards of application to valuation procedures. 2. Development of spheres of application for valuation of property and property rights. Discussion of the legislation of the European Union, Ukraine and other countries on the assessment of property and property rights. 3. Trends in the development of the evaluation methodology. Changes in views on the object and bases of valuation, valuation methods and requirements to the appraiser in international and national standards. Use of modern information technologies in the evaluation of property and property rights.